See the new Chevy Camaro Stealthboxes, available in both hidden and displayed configurations. You choose! Hundreds of other cars are available in the JL Audio Stealth Box application guide. Give us a call in our Long Island, Franklin Square, Nassau County showroom at (516) 489-2350 for pricing and availability. Your car audio system can have the Perfect look, Perfect fit, and Perfect bass! JL Audio Stealthboxes. The joy of driving this affordable German-engineered sedan is easily ruined by the weak bass of the factory audio system. Of course, you could fit any number of bulky subwoofer systems in the Jetta's big trunk compartment, but suddenly it wouldn't be so big anymore. Fortunately, JL Audio has the perfect Stealthbox® solution for the Jetta... one that totally transforms the audio system, serves as the perfect starting point for a superior JL Audio sound system and preserves your precious trunk space, too! The Stealthbox® for this model of Jetta sneaks into the little nook behind the driver side rear wheel and houses a robust 10-inch subwoofer. The result is visually unobtrusive, but delivers plenty of quality and impact. The Hard Data: Contains one 10W1v2-4 subwoofer in a sealed enclosure. 300 watt power handling. Wired for 4 ohm mono. Black steel mesh woofer grille is included. Installs in driver-side corner of trunk compartment. The stylish Dodge Durango features a highly versatile interior design that transforms from people to cargo-hauling mode in seconds, but leaves little space for a real subwoofer system. Fortunately for Durango owners who appreciate great audio, our Stealthbox® design team rose to the challenge and came up with a brilliant solution. The Stealthbox® for the Durango installs discreetly beneath the rear cargo floor and features a recessed space on its top for mounting an amplifier (not included). With the factory cargo floor panel in place, the sub (and amplifier) become totally invisible, even with the hatch open. The sealed enclosure design houses a down-firing, thin-line 13.5-inch driver to deliver serious low-frequency impact and sound quality that will add tons of enjoyment to every mile you drive. The Hard Data: Contains one 13TW5-3 subwoofer in a sealed enclosure. 600 watt power handling. Wired for 3 ohm mono. Black steel mesh woofer grille is included. Installs under cargo area floor panel. JL simply couldn't overlook the thousands of happy Elantra drivers who have chosen this great little sedan as transportation. JL also couldn't help noticing that the stock stereo could use some serious improvement in the bass frequencies. After setting out to find the perfect remedy and applying everything we know about world-class sub-bass, we have some great audio news for Elantra owners. Our Stealthbox® for the Elantra features a robust JL Audio 12-inch subwoofer housed in a compact, sealed, fiberglass enclosure which fits neatly into the passenger side rear corner of the trunk. The form-fitting design conserves your valuable trunk space while still permitting full access to the spare tire. A clean-looking steel mesh grille protects your investment from loose cargo. The Hard Data: Contains one 12W3v3-2 subwoofer in a sealed enclosure. 500 watt power handling. Wired for 2 ohm mono. Black steel mesh woofer grille is included. Installs in passenger-side corner of trunk compartment. The return of Chevy's iconic Camaro was met with tremendous enthusiasm by those who prize American-style performance. Its muscular looks, retro cockpit design and potent powertrain options convincingly recreate the muscle and attitude of the original models. If you're looking to rock the roads you're eating up in your Camaro, you will need to give the stock sound system a serious attitude enhancement. This starts with a true subwoofer. This Stealthbox® is designed for maximum sub-bass performance with its three 10W3v3 JL Audio subwoofer drivers in a 100% fiberglass sealed enclosure. The enclosure is offered finished in a high-grade automotive carpet as well as an unfinished (primered) option which is paint-ready to coordinate with any installation theme. Turn it up with this anything-but-ordinary bass boost for your Camaro. The Hard Data: Contains three 10W3v3-8 subwoofer drivers in a sealed enclosure. 1500 watt power handling. Wired for 2.7 ohm mono. Black steel mesh grilles included. Rear seat pass-through functionality is lost with installation. Available carpeted or in a smooth finish ready for primer and paint. The xB is a vehicle for those who value form, function and individual style. Unfortunately, the factory and dealer-installed audio systems are less than exciting in the bass department (unless you like weak, distorted bass). If you prefer powerful, tight and accurate bass, we now have the perfect solution in the form of a 12-inch W3v3 subwoofer driver in a sealed, fiberglass enclosure that nestles seamlessly into the passenger side cargo area, retaining your usable cargo space and full-access to the spare tire. So, get rid of that fuzzy woofer box that keeps getting in your way, and treat yourself to some serious bass performance. One custom-engineered, sealed Stealthbox® for the tC mounts securely on the passenger side of the hatch to achieve impressive output and fidelity with its 10-inch JL Audio subwoofer driver. Usable trunk space is barely affected and a steel mesh grille is included to protect the driver from all the stuff that still fits in your hatch. Whether you drive a normally aspirated Impreza, a powerful WRX or a fire-breathing STI, our Stealthbox® delivers world-class sub-bass without using up much of your trunk space. Premium fidelity is assured by the use of a JL Audio W6v2 10-inch driver in a sealed enclosure. The rear corner location ensures smooth, powerful response in the Impreza. Whether you opted for the go-anywhere Outback wagon or the road-hugging Legacy version, chances are that cargo space played a big role in your buying decision. The Stealthbox® design team took this into consideration when developing this incredible-sounding solution. This Stealthbox® tucks into the right corner of the hatch area and delivers tremendous, audiophile quality bass thanks to its powerful, 10-inch W6v2 subwoofer. Because hatch space is limited in the MkV Golf, we worked very hard to tuck our Stealthbox® out of the way while still providing a high-performance sub-bass experience. Every cubic inch of available space in the left rear corner of the hatch is used thanks to Stealthbox® fiberglass construction. Our premium 10W6v2 subwoofer is a natural choice for its outstanding performance in small sealed enclosures as well as its unparalleled sound quality attributes and high output capabilities. So, while other Golf drivers struggle with small, weak subwoofer solutions (or big, silly ones), you can enjoy top-shelf bass and get on with your life. The FJ Cruiser makes a bold statement by combining modern vehicle dynamics with dramatic styling that pays homage to the original Land Cruiser. For those seeking a superior audio experience without compromising the Cruiser's utility, this Stealthbox® represents the perfect solution. A powerful 12-inch driver delivers outstanding impact and fidelity without encroaching on the FJ's useful cargo space and a steel mesh grille provides protection when you load up the hatch with gear. The best-selling car in history is known to offer a great combination of comfort, value and reliability. What it doesn't offer is great sounding audio, especially in the low frequency department. With the addition of this Stealthbox®, it is now possible to achieve powerful and accurate bass response in the Corolla sedan, without giving up too much useful space.Using the robust and smooth-sounding 12W3v3 12-inch subwoofer, we have created a potent solution that installs solidly in the driver-side rear corner of the trunk, leaving plenty of room for all of life's necessities. Toyota's take on the mid-size, four-door pickup truck offers excellent people space, but doesn't really accommodate a conventional subwoofer solution. Our low-profile Stealthbox® design for the Double-Cab Tacoma utilizes two ten-inch, shallow-mount W1v2 subwoofers and tucks neatly behind the rear seat, where no one will see it, but where you and your passengers will definitely hear it and feel it. Honda's hyper-popular Civic Coupe is a favorite for a wide range of automotive enthusiasts, from the frugal commuter to the import tuning fanatic. 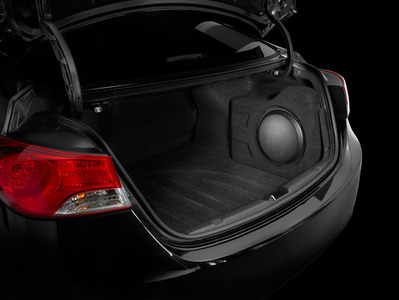 This Stealthbox® is something that all Civic owners can agree on... great sounding, super-powerful bass that doesn't eat up your trunk space. Our potent 10W6v2 subwoofer ensures that all your miles are enhanced with world-class sub-bass fidelity. The CR-V's combination of style and capability has placed it on top of the sales charts, proving that Honda has its fingers on the pulse of the market. It's too bad the audio system lacks a pulse, though... To address this shortcoming, we engineered a compact Stealthbox® solution that tucks into the corner of the hatch area, while still leaving plenty of room for all the stuff you want to carry. Inside the Stealthbox® is a powerful 10-inch driver that fills the CR-V's cabin with smooth, powerful bass and is ready to serve as the centerpiece of a truly outstanding audio system. The rest of the world knew about Honda's micro-masterpiece well before the U.S. market ever saw one, but once the Fit landed on these shores, its popularity exploded among those looking for stylish, economical transportation. While we certainly wanted to put some killer bass into this little car, we also wanted to preserve the cargo and people space. For this reason, we engineered the Stealthbox® to install into the corner of the hatch with minimal protrusion into the cargo area. Access to the spare tire, jack and tools remains unaffected, too. BMW's audio systems have come a long way in the last few years, but they still lack in the low frequency department. The underseat factory woofers are small and can only do so much. If you're seeking a real sub-bass solution with powerful output, excellent balance and impressive low-frequency extension, this Stealthbox® was made for you. Our 3-Series Stealthbox® design puts our patented low-profile TW5 subwoofer technology to excellent use, housing two 13.5-inch drivers in a sealed fiberglass enclosure with individual driver chambers. You'll have plenty of trunk space to spare... enough to fit a couple of golf bags or luggage for a long road trip. And with the sound quality this Stealthbox® delivers, you will enjoy every mile on those road trips. The 5th incarnation of the BMW 5-Series proves that BMW's mastery of the sport-sedan formula remains as strong as ever. The low-frequency capabilities of BMW's underseat woofers do leave something to be desired, however... so we have applied JL Audio's mastery of automotive sub-bass to design the ultimate subwoofer for the E60. This Stealthbox® tucks in behind driver side wheel well in the trunk compartment (without taking up very much useful space) and features our premium 12-inch, W6-class subwoofer for impeccable bass quality and amazingly strong output. Like the 7-Series it is designed to complement, this Stealthbox® is designed for effortless power and finesse. The power comes courtesy of a pair of our legendary 10W6v2 subwoofer drivers with up to 1200 watts of power handling capability. These outstanding woofers have been fine-tuned for the 7-series in a sealed enclosure that is precisely optimized to deliver superior linearity and fidelity. 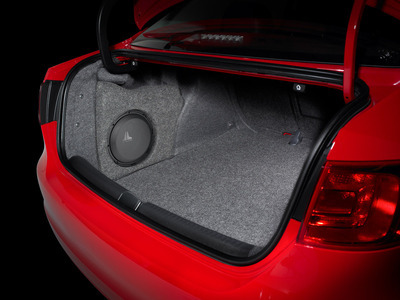 To overcome the challenge of delivering great bass response from this BMW's well-sealed trunk into the cabin, this system is designed to fire directly through the ski-holeopening. Solid mounting provisions anchor the Stealthbox® firmly to the vehicle for safety, without requiring any modification to the vehicle. The trunk-facing side of the enclosure blends smoothly with the contours of the trunk compartment, without interfering with spare tire access and leaving plenty of room for large golf bags and other cargo. The X5 artfully blends the dynamic attributes of a great road car with the utility and versatility of an SUV. What it doesn't have is a real subwoofer system. The small woofers under the front seats can only do so much. Our Stealthbox® design team has come up with the perfect subwoofer solution for the X5. It installs under the cargo floor and wraps around the spare tire, taking up no cargo space and remaining completely invisible. Inside the Stealthbox®, a 10-inch JL Audio subwoofer driver pounds out controlled and powerful sub-bass that will completely transform your listening experience. Call us at 516-489-2350 or Conact us to find out more. Visit our showroom in Franklin Square, NY to see the JL Stealthbox for yourself!